When Ishbel and her partner Richie were made redundant within a month of each other, they bought a split-screen VW campervan and busied themselves with their new-found hobby. We spoke to Ishbel about how she turned a terrible month in 2012 into a fantastic one when she started a vintage campervan hire business. 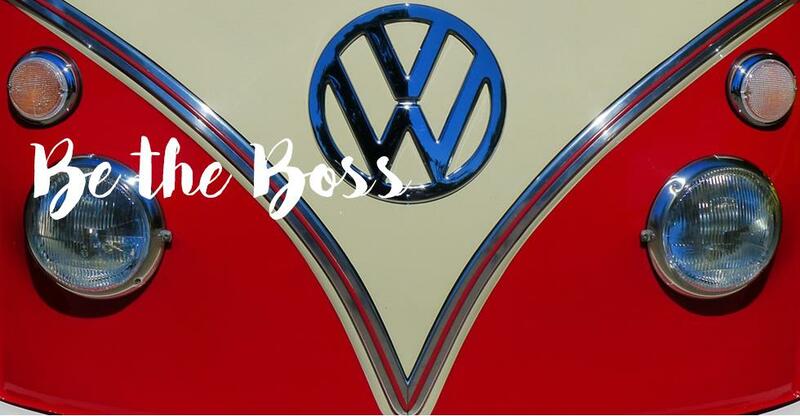 I set up Vintage VW Campers after I was made redundant from my job as area manager for a hospitality recruitment business. I’m a sole trader but I couldn’t do what I do without my partner Richie, who contracts for me, chauffeurs in our microbus and looks after the fleet. What inspired you to start Vintage VW Campers? We’ve always loved the freedom of camping and enjoyed being close to nature, and campervans allow you to do just that. Too many classic vehicles barely see the light of day and I think they should be out on the roads being enjoyed. Richie and I were both made redundant within a month of each other around Christmas 2012, so we decided to move out of our comfort zone and do something we both would love. Buying Meg, our split-screen microbus, in October 2013 was the point of no return. We decided to make some money from our hobby after that. Vintage VW Campers started trading in April 2014. How do you source your vehicles? Our latest addition came from a family friend, but we’ve bought VWs before from Car and Classic, eBay, Gumtree and from an advert placed inside a Beetle close to where we live. Neither of us are mechanics, so we do need expert assistance. VW campervans were built to last, and if you have the right mechanic, they will just keep on going. Davie Jardine from Solway Campers started maintaining our fleet for us in the first year. Now he’s had time to take them all apart and put them back together again. Our first two years saw a couple of breakdowns but nothing has come home on a tow truck this year – touch wood. We have an AA pack on board, so if something does go wrong, our guests can give the AA our bag of fuses, cables, bulbs etc. Can you take us through your typical day? We usually arrive at our Falkirk HQ between 8am and 10am, dependent on the day we have ahead of us. Living in the west of Edinburgh, this is an easy commute because we’re always going against the bulk of traffic. The campervans are all lovingly restored 1960s and ‘70s classic vehicles. We have five self-drive holiday campervans. The guests arrive at 10am and after I’ve checked their documents and set up their self-drive insurance, the customer is introduced to their camper and how to drive it. If we have a wedding or event on, then Richie will be getting Meg ready and changing into his chauffeur outfit. My afternoon office work will usually be a mix of customer service, sales, marketing, finance, and website and general administration. So not too different from what I did in the rat-race – but a whole world apart [in other ways] and so much more enjoyable. I love my job as I’m working with these iconic vehicles and sharing the joy of them with other VW fans. We’re very lucky to have so many lovely customers and we meet them at happy life events like holidays, honeymoons and weddings. We also love sharing our knowledge of Scotland, so our guests see the best places. We try to get as much feedback as possible from the customers. This is exceptionally valuable, and if they are relaxed and chatting to us, they are more likely to mention the wee things regarding the campervan’s performance that they wouldn’t usually feel are big enough to report. It’s these little things that are so helpful because they may give our mechanic a pointer on a developing issue. There is usually something that Richie has to fix when the campers come back. It could be a screw coming out, a window that has stopped winding or any number of small things that could spoil the next customer’s enjoyment and needs to be kept on top of. Our ethos is very much about preventative maintenance, rather than curative. What advice would you give to other aspiring business owners ? Do your market research and business plan before you commit to anything. Ensure you can make the figures work. We never set up this business to be millionaires; we set it up to give us a good quality of life, which includes campervan holidays before and after our customers in spring and autumn. So be clear about what you want to achieve and if you are going into business with friends or family, be clear you all want the same thing and can trust each other fully to put in the work required.